Take in two top-selling Los Angeles experiences for one amazing trip on this combo tour. 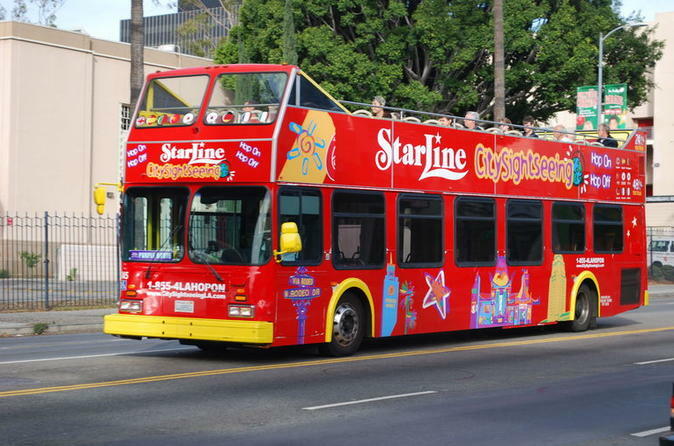 See popular attractions such as Paramount Studios, the Santa Monica Pier, Rodeo Drive and the Sunset Strip with a 1- to 2-day hop-on hop-off sightseeing pass on a double-decker bus. Then saddle up for a scenic 2.5-hour self-guided bike tour through the glitz and glam of Beverly Hills, Bel-Air and West Hollywood. Select your preferred route from the four options available and then hop aboard your double-decker bus at any of the listed stops. You’ll pass top sites like the Venice Beach Boardwalk, Universal Studios Hollywood, Rodeo Drive, the Hollywood Bowl and the Sunset Strip on this comprehensive experience of the city. Audio commentary in 9 languages will also be available on board as you travel to provide historical context for the scenery around you. Hop on and off as often as you like to explore the passing attractions on your own. Part ways with your bus at stop #6 on the red route when you’re ready to start your bike tour. Explore & experience the best of West Hollywood & Beverly Hills on your own time, at your own pace. This unique self-guided bike tour takes you where the tour buses can’t. It’s a “whenever-you-feel-like-it tour” - you pick the date and time that is most convenient then you’re off on your own LA bike adventure. The moment you hop on your bike, the attached GPS enabled iPad is your virtual guide that leads you on a specially designed route through the city telling you about your surroundings, pointing out LA’s highlights, hotspots and hidden gems, just like an in-person guide would do. You’ll pedal down the quaint streets of West Hollywood and over to the glamorous palm tree lined streets of Beverly Hills and Bel Air where you might catch a glimpse of a celebrity or two. Our specifically designed bike routes take you down quieter streets to ensure a relaxing, enjoyable bike ride away from busy city traffic. When you’re ready for a break, just hop off your bike, lock it up and have a fabulous lunch at one the many LA restaurants and cafes. Take a stroll down Rodeo Drive for a little shopping or relax in a Beverly Hills park for a bit.